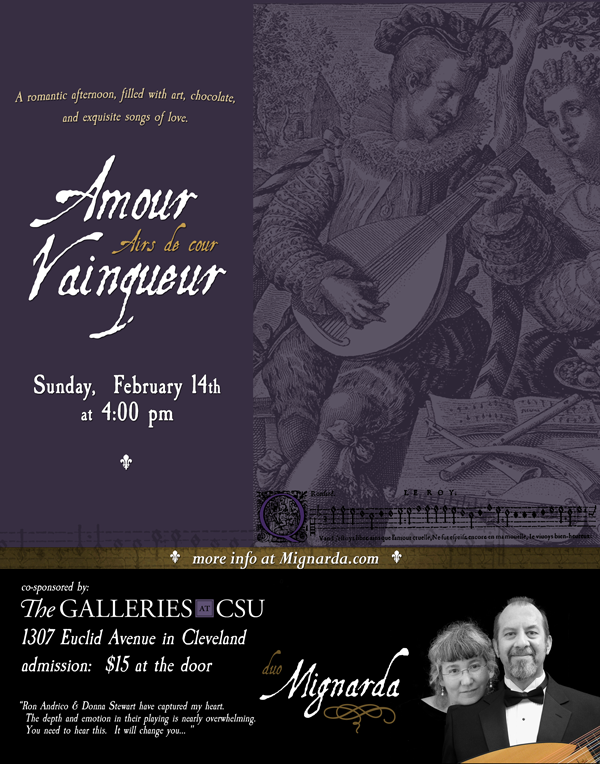 Internationally-renowned duo for voice and lute Mignarda (meen-YAR-dah) appears in a special Valentine's Day performance at The Galleries at CSU, returning to the repertoire of French love songs for voice and lute from their award-winning first recording. The concert will feature rhythmically intricate and beautifully expressive French courtly airs from the late 16th through the early 17th centuries composed by Adrian LeRoy, Pierre Guédron, Antoine Boësset, and Étienne Moulinié, as well as instrumental preludes, fantasias, and dances from the contemporaneous published lute books of Robert Ballard, Anthoine Francisque, and Nicolas Vallet. Also included is a rarely-heard selection of airs that were the basis for Ottorino Respighi's Ancient Airs and Dances suites. French court airs were drawn from lavishly-staged ballets de cour and featured singable tunes that were enormously popular during this period - some 800 airs were published in France between 1570-1640. Mignarda gets to the heart of the music with engaging performances that highlight the expressive poetry and rhythmic vitality of French airs de cour. Treat yourself to a romantic afternoon filled with art, chocolate, and exquisite songs of love. "My other band crush this year is Mignarda. What can I say? Ron Andrico and Donna Stewart have captured my heart. The depth and emotion in their playing is nearly overwhelming. You need to hear this. It will change you... "
Cleveland natives Donna Stewart & Ron Andrico, better known as Mignarda, are well-known to Cleveland audiences and one of the few professional lute song duos in the US. Dedicated to music of the 16th century, Mignarda's engaging approach has set a new standard for interpretation, authenticity and musicianship. Based in rural upstate NY, Mignarda performs throughout the US with an international audience for their ten critically-acclaimed recordings and a growing series of editions of historical music for voice and lute. Mignarda's CD, Divine Amarillis, received the 2009 JPF Best Classical Vocal Album Award, and the duo maintain an active schedule in touring, recording and teaching. In addition to live performances, their music has gained international exposure through radio and television broadcasts across the US. Capturing the nuance and intricacy of early music with warmth and flair, Mignarda’s performances remind 21st century audiences that at one time this was pop music. Now in their 12th year as a duo, they have travelled tens of thousands of miles to share this music with audiences across the U.S.